Rash caused by Epidemic typhus. For the unrelated disease caused by Salmonella typhi, see Typhoid fever. For the unrelated disease caused by Salmonella paratyphi, please refer to Paratyphoid fever. Typhus the name of any one of several similar diseases caused by particular bacteria in the Rickettsiaceae family and spread to humans by arthropod vectors (lice, fleas, mites, chiggers) from the endemic rodent hosts. The four main types of typhus are epidemic typhus (caused by Rickettsia prowazekii via lice), Brill-Zinsser disease (reactivation of earlier infection with epidemic typhus), endemic typhus (caused by Rickettsia typhi via fleas), and scrub typhus (classically caused by Rickesttsia tsutsugamushi via mites or chiggers, but the causal agent generally has been reclassified as Orientia tsutsugamushi) (Longe 2006). These diseases are somewhat similar, but differ in severity, as well as the insect vector and bacterial species (Longe 2006). Other diseases caused by bacteria in the genus Rickesttsia include Rocky Mountain spotted fever (R. rickettsii) and rickettsialpox (R. akari). The arthropod vector of epidemic typhus flourishes under conditions of poor hygiene and crowded conditions, such as those found in prisons or refugee camps, among the homeless, or until the middle of the twentieth century, in armies in the field. Prior to the development of a vaccine during World War II, epidemic typhus was a devastating illness throughout history. An outbreak in England between 1557 and 1559 killed about 10 percent of the English population, and during Napoleon's retreat from Moscow in 1812, more French soldiers died of typhus than were killed by the Russians. Being held in some crowded prisons was equivalent to a death sentence due to typhus. During World War I, an estimated three million deaths occurred in Russia and more in Poland and Romania, and thousands of prisoners held in the appalling conditions in Nazi concentration camps died of typhus during World War II. Even in the absence of an available vaccine in some Third World countries, typhus is a largely preventable disease, with prevention tied to personal and social responsibility. Fundamental is avoidance of the arthropod vectors that carry the bacteria, and thus good hygiene, insect repellents, and control of rodent populations have proven effective. Socially, there is a responsibility to maintain hygienic conditions in confined areas, such as prisons, and to educate regarding the cause of typhus and how to avoid it. Just as DDT was instrumental in preventing larger epidemics in the chaos of post-war Europe after World War I, there is a social responsibility for those governments and individuals with means to assist those without means in the avoidance of the disease. In tropical countries, typhus is often mistaken for dengue fever. Rickettsia is a genus of non-motile, Gram-negative, non-sporeforming, highly pleomorphic bacteria in the Rickettsiaceae family that can present as cocci (0.1 μm in diameter), rods (1-4 μm long), or thread-like (10 μm long). Obligate intracellular parasites, the Rickettsia depend on entry, growth, and replication within the cytoplasm of eukaryotic host cells (typically endothelial cells) (Walker 1996). Because of this, Rickettsia cannot live in artificial nutrient environments. In the past, they were regarded as microorganisms positioned somewhere between viruses and true bacteria. Rickettsia species are carried as parasites by many ticks, fleas, and lice, and cause diseases such as typhus, rickettsialpox, Boutonneuse fever, and Rocky Mountain spotted fever in human beings. They have also been associated with a range of plant diseases. Like viruses, they grow only in living cells. The name rickettsia often is used for any member of the order Rickettsiales. They are thought to be the closest living relatives to bacteria that were the origin of the mitochondria organelle that exist in most eukaryotic cells. The causative agent of scrub typhus formerly known as R. tsutsugamushi has been reclassified into the genus Orientia. The name "typhus" comes from the Greek typhos, meaning smoky or lazy, describing the state of mind of those affected with typhus. The Rickettsia species that cause typhus are endemic in rodent hosts, including mice and rats, and spread to humans through mites, fleas and body lice. Epidemic typhus is the most severe form of typhus. Also called "jail fever," "hospital fever," "ship fever," "famine fever," and "camp fever," (Beach 2007), epidemic typhus received its name because the disease often causes epidemics following wars and natural disasters. The causative organism is Rickettsia prowazekii, transmitted by the human body louse (Pediculus humanus humanus) (Gray 1998). Feeding on a human or rodent who carries the bacillus infects the louse. R. prowazekii grows in the louse's gut and is excreted in its feces. The disease is then transmitted to an uninfected human who scratches the louse bite (which itches) and rubs the feces into the wound. The incubation period is one to two weeks. R. prowazekii can remain viable and virulent in the dried louse feces for many days. Typhus will eventually kill the louse, though the disease will remain viable for many weeks in the dead louse. The symptoms set in quickly, and are among the most severe of the typhus family. They include severe headache, a sustained high fever, cough, rash, severe muscle pain, chills, falling blood pressure, stupor, sensitivity to light, and delirium. 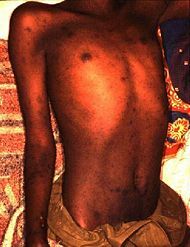 A rash begins on the chest about five days after the fever appears, and spreads to the trunk and extremities but does not reach the palms and soles. A symptom common to all forms of typhus is a fever, which may reach 39°C (102°F). The most serious complications include swelling in the brain (encephalitis) or the heart muscle (Longe 2006). Without treatment, the disease can be fatal. Means of diagnosis include determining the reactions of the patient's antibodies to the presence of certain bacterial and viral markers. The infection is treated with antibiotics, such as tetracycline or chloramphenicol (Longe 2006). Intravenous fluids and oxygen may be needed to stabilize the patient. The mortality rate is 10 percent to 60 percent, but is vastly lower if antibiotics such as tetracycline are used early. Infection can also be prevented via vaccination. The body lice that cause typhus are more common in crowded, dirty environments. Epidemic typhus hits hardest during times of war and privation, when large numbers of individuals may be crowded together. For example, typhus killed many thousands of prisoners in Nazi Germany concentration camps during World War II. The abysmally low standards of hygiene enforced in camps such as Theresienstadt and Bergen-Belsen created conditions where diseases such as typhus flourished. A possible modern scenario for typhus epidemics would be in refugee camps during a major famine or natural disaster. This form of typhus is known as "prison fever" or "ship fever" because it becomes prevalent in crowded conditions in prisons and aboard ships. 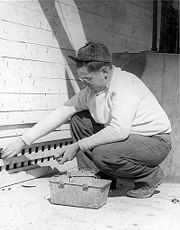 Brill-Zinsser disease is a mild form of epidemic typhus, involving the reactivation of the earlier infection after a long period of latency (similar to the relationship between chickenpox and shingles). People are affected years after recovering completely from epidemic typhus (Longe 2006). This type of recurrence occurs in patients who have a weakening of their immune system, such as with illness, surgery, or aging, as the bacteria regains its hold. Brill-Zinsser disease tends to be extremely mild, resulting in a week-long fever and a light rash similar to that of the original illness; there is no threat of death (Longe 2006). Endemic typhus, also called "flea-borne typhus," "murine typhus," and "rat flea typhus," is caused by the bacteria Rickettsia typhi, and is transmitted by the fleas that infest rats (TDSHS 2005). Less often, endemic typhus is caused by Rickettsia felis and transmitted by fleas carried by cats or possums. If a flea carrying the bacteria lands on a human and defecates as it feeds, the bacteria-laden feces may be scratched into the skin when the person scratches the itchy spot where the feed was feeding (Longe 2006). Endemic typhus is common in warm, coastal regions, with the largest numbers of cases in the United States found in southern Texas and southern California (Longe 2006). People usually recover without further complications, although the elderly, infirm, or those mistakenly treated with sulfa drugs may have a one percent death rate (Longe 2006). Symptoms of endemic typhus include headache, fever, chills, myalgia, nausea, vomiting, and cough. There may be twelve days of fever and a light rash (Longe 2006). Endemic typhus is highly treatable with antibiotics. (TDSHS 2005). Most people recover fully, but death may occur in the elderly, severely disabled or patients with a depressed immune system. Scrub typhus, also called "chigger-borne typhus," is caused by Orientia tsutsugamushi and transmitted by chiggers, which are the larvae of harvest mites (genus Trombicula), which also are known as scrub mites and red mites. Chiggers are found in areas of heavy scrub vegetation. The mites deposit the bacteria when they feed on humans. This disease is common in the southwest Pacific, southeast Asia, and Japan, and is very common among people living in, or visiting, these areas, particularly during the wet season (Longe 2006). Symptoms include fever, headache, muscle pain, cough, and gastrointestinal symptoms. Some patients develop a rash, and the individual spots will develop crusty black scabs (Longe 2005). More virulent strains of O. tsutsugamushi can cause hemorrhaging and intravascular coagulation. Serious complications include encephalitis, pneumonia, and swelling of the liver and spleen (Longe 2006). Untreated scrub typhus results in a death rate of about seven percent, but scrub typhus responds well to antibiotics (Longe 2006). The first major step in the development of the vaccine was Charles Nicolle's 1909 discovery that lice were the vectors for epidemic typhus. This made it possible to isolate the bacteria causing the disease and develop a vaccine; he was awarded the 1928 Nobel Prize in Physiology or Medicine for this work. Nicolle attempted a vaccine but was not successful in making one that worked on a large enough scale (Gross 1996). Henrique da Rocha Lima in 1916 then proved that the bacteria Rickettsia prowazekii was the agent responsible for typhus; he named bacteria after H. T. Ricketts and Stanislaus von Prowazek, two zoologists who died investigating a typhus epidemic in a prison camp in 1915. Once these crucial facts were recognized, Rudolf Weigl in 1930 was able to fashion a practical and effective vaccine production method by grinding up the guts of infected lice that had been drinking blood. It was, however, very dangerous to produce, and carried a high likelihood of infection to those who were working on it. A safer mass-production-ready method using egg yolks was developed by Herald R. Cox in 1938 (Mazal 2007). This vaccine was used heavily by 1943. Civilian Public Service worker distributes rat poison for typhus control in Gulfport, Mississippi, ca. 1945. The first description of typhus was probably given in 1083 at a convent near Salerno, Italy (Szybalski 1999). In 1546, Girolamo Fracastoro, a Florentine physician, described typhus in his famous treatise on viruses and contagion, De Contagione et Contagiosis Morbis. Before a vaccine was developed in World War II, typhus was a devastating disease for humans and has been responsible for a number of epidemics throughout history (Zinsser 1935). These epidemics tend to follow wars, famine, and other conditions that result in mass casualties. During the second year of the Peloponnesian War (430 B.C.E. ), the city-state of Athens in ancient Greece was hit by a devastating epidemic, known as the Plague of Athens, which killed, among others, Pericles and his two elder sons. The plague returned twice more, in 429 B.C.E. and in the winter of 427/426 B.C.E. Epidemic typhus is one of the strongest candidates for the cause of this disease outbreak, supported by both medical and scholarly opinions (Gomme 1981). At a medical conference at the University of Maryland, Dr. David Durack, consulting professor of medicine at Duke University noted: "Epidemic typhus fever is the best explanation. It hits hardest in times of war and privation, it has about 20 percent mortality, it kills the victim after about seven days, and it sometimes causes a striking complication: gangrene of the tips of the fingers and toes. The Plague of Athens had all these features (UMMC 1999). Typhus also arrived in Europe with soldiers who had been fighting on the isle of Cyprus. The first reliable description of the disease appears during the Spanish siege of Moorish Granada in 1489. These accounts include descriptions of fever and red spots over arms, back and chest, progressing to delirium, gangrenous sores, and the stink of rotting flesh. During the siege, the Spaniards lost 3,000 men to enemy action but an additional 17,000 died of typhus. Typhus was also common in prisons, where it was known as gaol fever or jail fever. Gaol fever often occurs when prisoners are frequently huddled together in dark, filthy rooms. Imprisonment until the next term of court was often equivalent to a death sentence. It was so infectious that prisoners brought before the court sometimes infected the court itself. Following the Assize held at Oxford in 1577, later deemed the Black Assize, over 300 died from epidemic typhus, including Sir Robert Bell Lord Chief Baron of the Exchequer. The outbreak that followed, between 1557 to 1559, killed about 10 percent of the English population. During the Lent Assize Court held at Taunton (1730) typhus caused the death of the Lord Chief Baron, as well as the High Sheriff, the sergeant, and hundreds of others. During a time when there were 241 capital offenses, more prisoners died from gaol fever than were put to death by all the public executioners in the realm. In 1759, an English authority estimated that each year a fourth of the prisoners had died from gaol fever (Smith 1967). In London, typhus frequently broke out among the ill-kept prisoners of Newgate Gaol and then moved into the general city population. 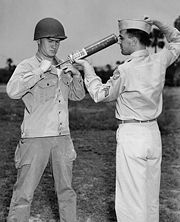 A U.S. soldier is demonstrating DDT-hand spraying equipment. DDT was used to control the spread of typhus-carrying lice. Epidemics occurred throughout Europe from the sixteenth to the nineteenth centuries, and occurred during the English Civil War, the Thirty Years' War, and the Napoleonic Wars. During Napoleon's retreat from Moscow in 1812, more French soldiers died of typhus than were killed by the Russians. A major epidemic occurred in Ireland between 1816-19, and again in the late 1830s, and yet another major typhus epidemic occurred during the Great Irish Famine between 1846 and 1849. The Irish typhus spread to England, where it was sometimes called "Irish fever" and was noted for its virulence. It killed people of all social classes, since lice were endemic and inescapable, but it hit particularly hard in the lower or "unwashed" social strata. In America, a typhus epidemic killed the son of Franklin Pierce in Concord, New Hampshire in 1843 and struck in Philadelphia in 1837. Several epidemics occurred in Baltimore, Memphis, and Washington, DC between 1865 and 1873. Typhus fever was also a significant killer during the US Civil War, although typhoid fever was the more prevalent cause of US Civil War "camp fever." Typhoid is a completely different disease from typhus. During World War I, typhus caused three million deaths in Russia and more in Poland and Romania. De-lousing stations were established for troops on the Western front, but the disease ravaged the armies of the Eastern front, with over 150,000 dying in Serbia alone. Fatalities were generally between 10 to 40 percent of those infected, and the disease was a major cause of death for those nursing the sick. Some historians assert that the disease may serve as a model for the use of biological weapons while in the field. Between 1918 and 1922, typhus caused at least 3 million deaths out of 20–30 million cases. In Russia, after World War I, during a civil war between the White and Red armies, typhus killed three million, largely civilians. Even larger epidemics in the post-war chaos of Europe were only averted by the widespread use of the newly discovered DDT to kill the lice on millions of refugees and displaced persons. During World War II typhus struck the German army as it invaded Russia in 1941 (Mazall 2007). In 1942 and 1943, typhus hit French North Africa, Egypt, and Iran particularly hard (Zarafonetis 1963). Typhus epidemics killed inmates in the Nazi Germany concentration camps, infamous pictures of typhus victims' mass graves could be seen in footage shot at Bergen-Belsen concentration camp (Mazall 2007). Thousands of prisoners held in appalling conditions in Nazi concentration camps such Theresienstadt and Bergen-Belsen also died of typhus during World War II (Mazall 2007), including Anne Frank and her sister Margot. Following the development of a vaccine during World War II epidemics occur only in Eastern Europe, the Middle East, and parts of Africa. Beach, I. 2007. Diseases and medical terms for genealogists (P-T). Sedgleymanor.com. Retrieved October 15, 2007. Fracastoro, G. 1546. De Sympathia et Antipathia Rerum Liber Unus. De Contagione et Contagiosis Morbis et Curatione Libri iii. Venetiis: [Apud heredes Lucaeantonii Juntae Florentini]. Gomme, A. W., A. Andrewes (ed. ), and K. J. Dover (ed.). 1981. An Historical Commentary on Thucydides, Volume 5. Book VIII. Oxford University Press. ISBN 019814198X. Gray, M. W. 1998. Rickettsia, typhus and the mitochondrial connection. Nature 396: 109-110. Gross, L. 1996. How Charles Nicolle of the Pasteur Institute discovered that epidemic typhus is transmitted by lice: Reminiscences from my years at the Pasteur Institute in Paris. Proc. Natl. Acad. Sci. 93: 10539-10540. Mazal Library. 2007. Nuernberg Military Tribunal, Volume I: Typhus and other vaccine experiments. Mazal Library. Retrieved October 15, 2007. Szybalski, W. 1999. Maintenance of human-fed live lice in the laboratory and production of Weigl's exanthematous typhus vaccine. In K. Maramorosch and F. Mahmood, eds., Maintenance of Human, Animal, and Plant Pathogen Vectors. Enfield, NH: Science Publishers. 1578080495. Retrieved October 15, 2007. Texas Department of State Health Services (TDSHS 2005). Information on Murine Typhus (Fleaborne Typhus) or Endemic Typhus. Texas Department of State Health Services. Retrieved October 15, 2007. University of Maryland Medical Center (UMMC). 1999. Plague of Athens: Another medical mystery solved at University of Maryland. University of Maryland Medical Center. Retrieved October 15, 2007. Walker, D. H. 1996. Rickettsiae. In S. Barron, et al. Barron's Medical Microbiology 4th edition. Univ of Texas Medical Branch. ISBN 0963117211. Zarafonetis, C. J. D. 1963. Internal medicine in World War II, Volume II, Chapter 7. Medical Department, United States Army. Retrieved October 15, 2007. Zinsser, H. 1935. Rats, Lice and History: A Chronicle of Pestilence and Plagues. Atlantic Monthly Press by Little, Brown, and Company. Originally published in Boston in 1935, later edition in 1963. Most recent edition 1996, Black Dog & Leventhal Publishers, New York. ISBN 1884822479. This page was last modified on 2 April 2008, at 18:11.